Perseverance vs. Persistence: The Art of Never Giving Up! RB31: P.J. 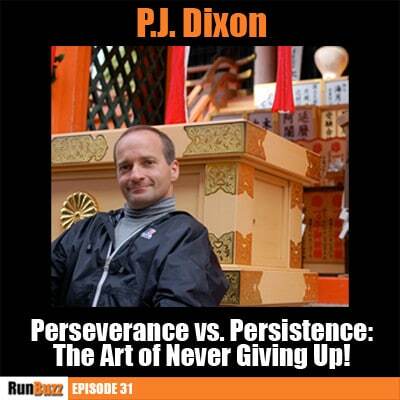 Dixon – Perseverance vs. Persistence: The Art of Never Giving Up! Have you ever wanted to challenge your own persistence? Or, perhaps, you wish to increase your odds of not giving up. Do you struggle with finding personal motivation or staying in the right mindset when it comes to running or even life in general? Well then do I have a special treat for you! In today’s episode, I welcome a personal friend of mine, P.J. Dixon. While P.J. is not a runner, he has done amazing things, despite having a rare form of muscular dystrophy that was supposed to take his life by age 7 – P.J. is now about to turn 46. Over the course of his life so far, P.J. has not let his disability stop him from making astounding accomplishments. He is a downhill skier, skydiver, amateur water colorist, former wheelchair athlete, 10th degree black belt, women’s self-defense instructor, international traveler, published author, motivational speaker, and success strategist. He has traveled the world, speaking to crowds of all sizes and has even appeared on television to share his inspirational message. I have been fortunate enough to have known P.J. since middle school. We both attended the same school and graduated together. P.J. is one of the most selfless people I know. He would give you the shirt off his back to help you, even give up his wheelchair if he thought you needed it. He lives life with a sense of vigor, passion, and unwavering purpose. I don’t say these things just to hype you up for P.J. and this interview – he really is this amazing guy. In this podcast, P.J. will challenge your thought process and help you build a powerful mindset when it comes to perseverance, persistence, and not giving up. You’ll hear things that will break your heart one minute and then make you laugh so hard, coffee may shoot out of your nose, the next. By the time you reach the end of the interview, you may have a new attitude towards life and a new way to think about life’s challenges. If you struggle with running, if you struggle with quitting, if you struggle with confidence, if you struggle with maintaining an exercise program, if you struggle with mood, or if you struggle with anything in life, then this episode will help you! The impact of P.J.’s mother on his life and how she never let him say, “I can’t”. How your thoughts and actions of quitting impact your subconscious mind, future actions, and those you have an influence over (like your kids!). How growth and habits only develop when we’re open and receptive to them. How resistance is normal and required for growth and personal breakthrough. Hooking Rottweilers up to a wheelchair – why the attitude of persistence is NOT the same as perseverance. 3 ways to take action! How is your ‘want to’? What it means to sleep in vs. getting your run in. How to wake up with energy instead of dread. Why going from negative to neutral is the first step to being positive. Why you should choose life and start living! If you think you can do a thing or think you can’t do a thing, you’re right.